If you are looking for raptors on Disposal Road on a weekday, please be aware that huge landfill vehicles use the road regularly and may not see you if you are birding on the road. Best to be cautious, and park off the road itself. 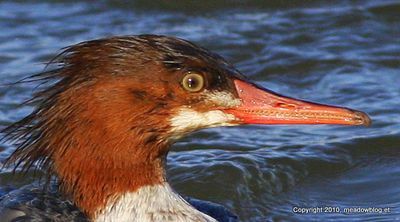 The two DeKorte ducks are a male Ruddy (top) and a female Common Merganser (bottom). They were photographed near each other in Teal Pool. Thanks to all who ID'd these ducks correctly! 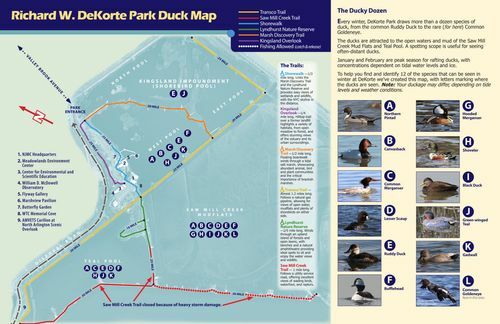 Thanks to the Meadowlands Commission's art director, Mimi Sabatino, the crude DeKorte Duck Map we put together last month has been superseded by a spiffy new improved version. 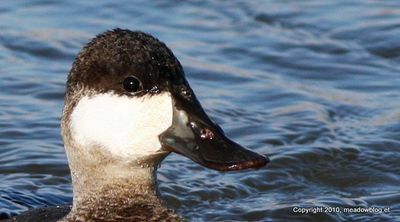 To help novice birders identify the various species, we have included photos the "Ducky Dozen" — the most-likely-to-be-seen ducks, and what tidal impoundments you are most likely to see them. As we note on the map, "Your duckage may differ." Download the map here: Download NJMC Winter Duck Map LR.